Would you like to start your own business in a sustainable and inspiring way? Do you want to make a difference in your own life? Then New Business #2 could be your next step! New Business is a mastery training program of 9 x 3 days over a year. The training is offered by changels and lower east – and done in collaboration with the KaosPilots Switzerland. Main trainers are Matti Straub-Fischer (head of changels and KaosPilots Switzerland) and Jørgen Smidstrup (communication designer and project maker in Lower East and Lower East Lab). The full programme starts April 6th 2016 in Bern, Switzerland (8 modules in Bern and one in Berlin). 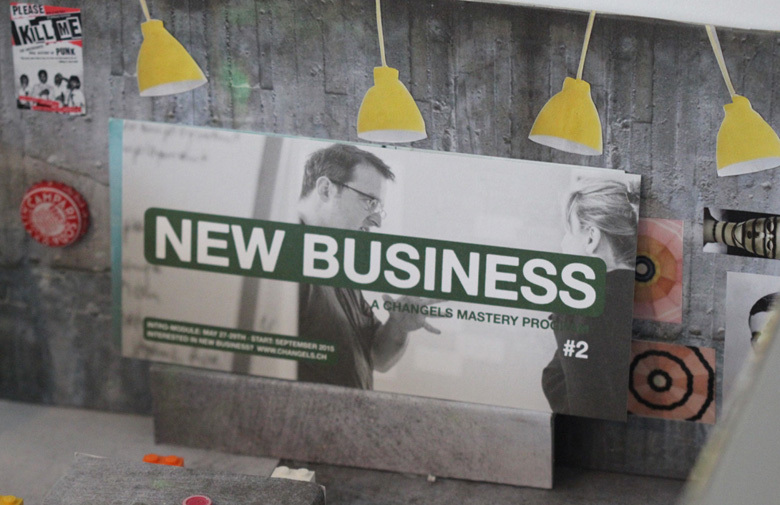 “The NEW BUSINESS is a great space for me to get new tools, perspectives, and ideas, to profit from others, from the trainers, my classmates and the KaosPilots − and hopefully vice versa. And it is really a great space, making possible new experiences and motivating me to do, to try, to fail, to exercise and to succeed”. Thom Buchmüller. “The open atmosphere and active exchange with the other NEW BUSINESS members, the teachers and the Kaos-Pilots have created a space for me, which has enabled me to bring my passions and dreams on a paper and create a first project out of it“. Karin Ehrler. “when changels offered the NEW BUSINESS mastery training, this was the perfect option for me. I love the inspiring spirit, the great team and the demanding learning challenges − here I have to leave my comfort zone”. Claudio Pacozzi. “I have fundamentally changed my perspective on what it means to create and run a successful business. NEW BUSINESS has offered me an alternative viewpoint to common beliefs about “serious business” that I had deeply internalised. The program has taught me to take my passions, potentials and dreams rather than limits and imagined deficits as my references. Our personal interchange in the group strongly supports me on my way and creates valuable new relationships”. Fabian Leuthold. Reach out if you want to know more, and want to join the program. Find more info on the new business blog and on the changels website.